The RTQ2569 is a high input voltage (36V), low quiescent current (2μA), low-dropout linear regulator (LDO) capable of sourcing peak 200mA. 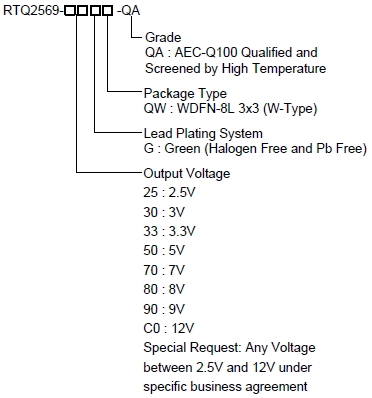 The device supports high input voltage with few component makes it easy to use. The high input voltage, low dropout voltage, ultra-low quiescent current, and miniaturized package as low as 2μA, the RTQ2569 is ideally suited for automotive and other battery operated system. The RTQ2569 retains all of the features that are common to low-dropout, short circuit protection and thermal operation. The RTQ2569 has 36V maximum operating voltage limit -40°C to 125°C operating temperature range. The RTQ2569 is available in WDFN-8L 3x3 package.